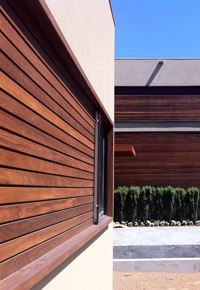 The trend toward using tropical decking wood as home siding. While Ipe, Cumaru, and other tropical hardwoods are commonly thought of as “decking species,” these species that are ideal for exterior applications also look great cladding homes and other buildings. Using tropical decking lumber as siding is a smart idea: tropical decking lumber is beautiful, weather-resistant, and renewable. For both aesthetic and practical purposes, the use of hidden fastening systems for tropical decking siding makes perfect sense. Unlike traditional wood siding, with tongue-and-groove joints connecting edges, that has to be screwed or nailed into place, decking lumber installation has become synonymous with hidden clip fastening systems. That means your gorgeous, long-lasting wood siding won’t be plagued with the blemish-ridden appearance caused by fastening holes; instead, the clips are secured to the furring strips, hiding all visible fasteners. The use of a fastening system similar to the kind used for decking installation also provides consistent spacing and includes an allowance for seasonal movement. To accommodate the use of hidden fastening systems, however, decking boards require grooves in order to provide for clips to hold the siding. Between clips, open grooves could potentially trap water or provide shelter for insects. 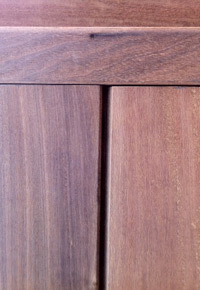 Traditional tongue-and-groove systems provide for the groove to be filled in along the entire board length, eliminating this potential pitfall. In addition, the manufacturers of clip systems provide various solutions, often including the idea of tucking the groove behind a beveled edge. While such a remedy accounts for water, it does nothing to eliminate the potential of insect invasion. Of course, insect-resistant species such as Ipe can all-but eliminate such a concern. Another potential problem can be caused by the long drip edge, possibly leading to uneven moisture absorption and, by extension, the eventual buckling of the siding. When you use high-quality tropical decking lumber, the potential problems mentioned above become non-issues. Because Ipe and other premium species are incredibly rot, insect, and water resistant, they will be able to stand up to all of that on a vertical surface. When you consider that they hold up to standing water on horizontal surfaces and the direct impact of rain and other precipitants, you’ll understand how a vertical surface should be no problem, at all. 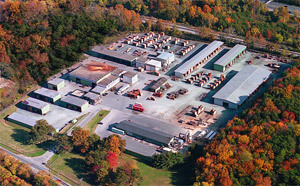 This up-and-coming market for tropical hardwoods is an exciting new prospect for lovers of quality lumber. Here at J. Gibson McIlvain, we specialize in Ipe decking and carry a large inventory of various lengths and widths. We’re thrilled to see this premium species being used for purposes other than decks and can’t wait to see how other uses evolve over time. Because of its appearance, resilience, and environmentally friendly aspects, we predict that its uses will only increase throughout the next decade. To find out more about Ipe or other high-quality decking species that are ideal for siding applications, contact our tropical hardwood lumber specialists, today. 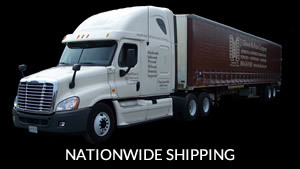 Call us toll free at (800) 638-9100.